If you are planning a big outing, be it for a wedding, party, prom, etc., you may want to look into charter transportation services. Not only will this service get you where you need to go, on time and safe, but it will do it in style and comfort. Here at Professional Charter Services, we strive to embody the principles of respect and integrity, and think it shows in our nine years of service. Here, we’d like to go over some tips for choosing charter services in San Francisco. In general, the longer a charter service company has been in business, the more trust and authority they will have built up. Also, if they’ve been in business for a long time, there should be a long trail of reviews and testimonials to judge previous customer satisfaction. A little research goes a long way in determining a company’s commitment to quality charter service. Check out some of our reviews at Professional Charter Services. What Are Their Safety Features/Standards? The most important part of any charter service is ensuring your safety. Not only should the drivers be seasoned professionals, but their vehicles should be regularly serviced and have standard safety features, like anti-lock brakes. Drivers should also follow all regulations regarding maximum drive hours for their region. Once you’ve ensured that you’ve found a safe and respectable charter service company, it’s time to start thinking about the luxuries. Usually, these will be listed on the company site, or at least available by phone call. Here at Professional Charter Services, our charter coaches are designed to include the following features. You’re probably going to have a lot of vehicle options to choose from, and each are going to work better for certain situations. A coach bus or party sprinter is obviously going to work better with bigger groups, and allows more room for movement. These are great options for parties, team events, prom, etc. If you’re looking to enjoy your luxury in a more peaceful, secluded setting, a town car or SUV might be the better option. 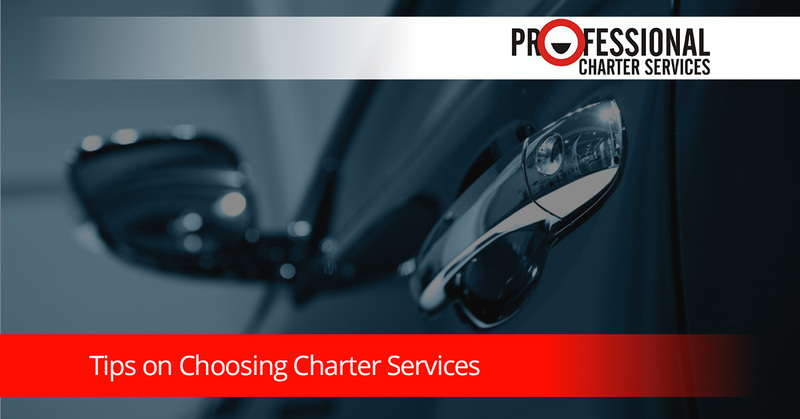 Here at Professional Charter Services in San Francisco, we’re committed to providing a safe, enjoyable, and timely ride to our clients. We encourage you to give us a call and discuss our services, we’ll be happy to answer any questions that you may have. We look forward to hearing from you!